A group photo taken at the Alpha Sigma Chi charter induction ceremony and formal installation of officers held in April of 2011. Participants include English faculty, student members and the faculty advisor. 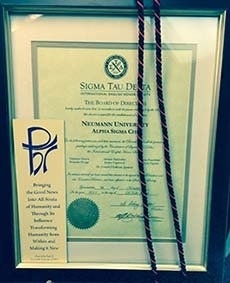 The Alpha Sigma Chi Chapter of Sigma Tau Delta was established at Neumann University in 2011. Dr. Gerard O’Sullivan, then VPAA (2006-2015) and Professor of English, was the Chapter’s founding advisor. The Chapter’s Faculty Advisor for FY2015-16 is Dr. William Hamilton. and Serve society by fostering literacy. With over 870 active chapters located in the United States and abroad, there are more than 1,000 Faculty Sponsors, and approximately 9,000 members inducted annually. Sigma Tau Delta also recognizes the accomplishments of professional writers who have contributed to the fields of language and literature. The Association of College Honor Societies (ACHS): Sigma Tau Delta is one of the largest members of the Association of College Honor Societies (ACHS), the nation’s only certifying agency for college and university honor societies. All active undergraduate and graduate members of active Sigma Tau Delta chapters are invited to submit their work to The Sigma Tau Delta Review and The Sigma Tau Delta Rectangle. Chapter Sponsors, faculty members, alumni (including members of the Alumni Epsilon Chapter), and honorary members are not eligible to submit. Submissions for 2016 journals will be accepted between April 6 and May 11, 2015. The Sigma Tau Delta Review (founded in 2005) is an annual journal that publishes critical essays on literature, essays on rhetoric and composition, and essays devoted to pedagogical issues. Submissions should not exceed 3,000 words. Critical essays must follow the Modern Language Association style guidelines as defined in the MLA Handbook for Writers of Research Papers (latest edition). The Sigma Tau Delta Rectangle (founded in 1931) is an annual journal of creative writing that publishes fiction, non-fiction, and poetry. Submissions should not exceed 2,500 words. These journals are refereed, with jurors from across the country selecting those members to be published. The journals have had illustrious head judges including: Jane Brox, Henri Cole, Jim Daniels, W.D. Earhardt, CJ Hribal, Kyoko Mori, Lisa Russ Spaar, and Mako Yoshikawa, to name a few. The best writing is chosen, from around 1,000 submissions, for publication. Not only do these publications go to chapters worldwide, but they also honor the best writing in each category, with six awards totaling $2,400. There is also an annual reading at the international convention by any of the published writers in attendance. The Sigma Tau Delta website.